Cristian Grases joined the USC Thornton faculty in the Fall 2010 semester and is currently an associate professor of choral music and conductor of the USC Thornton Concert Choir. Born in Venezuela, he earned degrees from the Simón Bolívar University (MM) in Caracas, Venezuela, and the University of Miami (DMA). He has previously served as interim director of choral activities at Central Washington University; assistant professor in choral music at California State University, Los Angeles; and national coordinator of choirs for EL SISTEMA under Maestro José Antonio Abreu. He also served as conductor for the Women’s Chamber Ensemble of the University of Miami, was the assistant conductor of the Miami Symphony Orchestra under Maestro Eduardo Marturet, and the conductor of the Young Musician’s Orchestra. 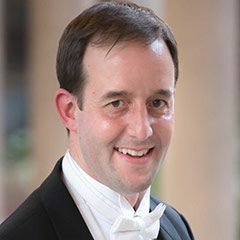 Additionally, he is an award-winning conductor and composer, and has been commissioned to write for several prestigious organizations such as the Piedmont Children’s Chorus and the Santa Fe Desert Chorale. Numerous ensembles including the Los Angeles Master Chorale have performed his works. Dr. Grases has participated in numerous festivals, workshops, and events as a guest conductor, clinician, adjudicator, and conducting pedagogue in North and South America, Europe, Asia, and Australia. He has also presented sessions in the World Choral Symposia in Denmark, Argentina, and South Korea. Additionally, he has presented at several ACDA regional and national conventions and conducted the National Latin American Honor Choir at the Salt Lake City ACDA National Convention. Dr. Grases was elected into the Board of Directors of the International Federation for Choral Music in 2008 and is currently a member of the Executive Board as a Vice-President representing the region of Latin America and the Caribbean. In addition, Grases was the chair of the Ethnic Music Repertoire and Resources Committee for the Western Division of the American Choral Directors Association (2009-2018), he is part of the editorial board of the International Choral Bulletin (2005-present), was the editor of the “Children’s and Youth” Column for the bulletin (2005-2017), was the founding Artistic Director for the Esperanza Azteca Los Angeles Orchestra and Amazonia Ensemble, and serves in numerous international artistic committees including Songbridge and the World Youth Choir. He also serves as the Artistic Director of Meritage Vocal Arts Ensemble. In 2013 Dr. Grases started a new Choral Series entitled The Choral Music of Latin America and the Caribbean published by Gentry Publications as an editorial outlet for Latin American choral repertoire.